I was up late the other night.. just couldn't seem to fall asleep. (What's new, right? Haha.) I guess it's because there's been a lot on my mind lately. I thought about all the things I wanted to do, and wrote them down on paper. Most of them involve me being in other parts of the world. Ever since my Asia trip, I've been on what you can call.. a travel high. I've been wanting to explore and see more parts of the world, experience more cultures, and document them. However, I think I've just about maxed out my travelling plans for the rest of this year. There's LA with the girls coming up in a few which I'm very excited for though! I came across this article awhile back, stating reasons as to why you should travel when you're young. And I couldn't agree more. So give it a read if you have the time. Maybe it'll inspire you to take that backpacking trip in Europe. Go hiking in the Himalayas. Cook up a storm with groceries you bought from a floating market in Thailand.. or volunteer at a village school in India. I'm pretty sure you can cross off #17 on your bucket list. Sharing this post is pretty inspiring. 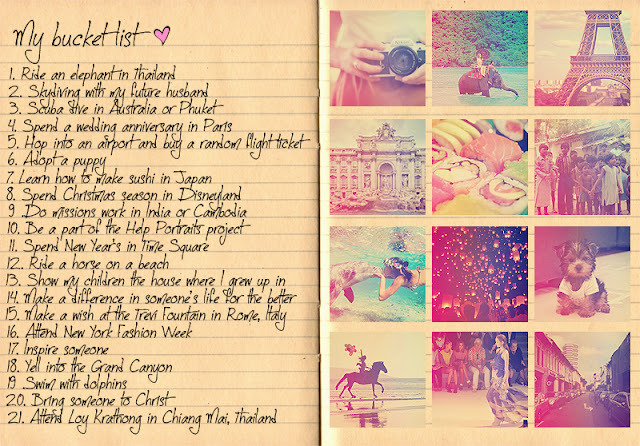 I don't have a bucket list but maybe I'll make one soon. I wish I travelled more when I was younger but for some reason the travelling bug never bit. My sister, however, loves to travel. She's been to lots of different countries. Her most recent trip was to India (3wks) & China (1wk). She's more adventurous than me & my other sister. This is an amazing list you have here! I especially love #5. Awww thanks girl <3 I love making lists too! Haha I'm such a lists type of girl. I would def love to visit India sometime soon on a missions trip :) It would be a blessing to go! "So if you get the opportunity to travel, I say do it. Go. Create your own adventures. Live life. Make memories and seize the moments, because they are going to be incredible." I'm living by this now. I used to be so busy with work that I travel only once a year. This year, I've been to 4 different countries and there would be a 5th one up next. Never has this happened to me before. I'm glad to hear our similar ideals and that you're also doing this. Thanks babe! YES Singaporeans need to travel more hahaha. Always so stress with work and no time for travels!! But wow that's awesome :) Can't wait to see your pics! !